This is an interesting prototype. The hand has enough control to pick up glasses and the device is mounted on a rail that extends the length of the counter. The device is controlled by a camera mounted over the arm. 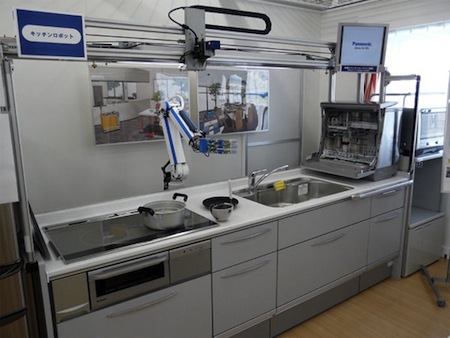 Take a look at this short video of the dish washing robot arm in action. 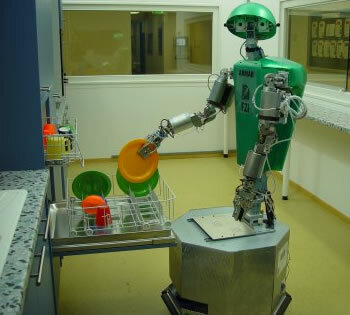 I'm in favor of any robots designed to perform tasks like dishwashing, even though they aren't full humanoid bots like ARMAR the kitchen robot, for example. ...you need cause Flexible Frank to clear the table and scrape the dishes and load them into the dishwasher only once, and from then on he could cope with any dirty dishes he ever encountered. Better still, he could have an electronically duplicated Thorsen tube stuck into his head and could handle dirty dishes the first time he ever encountered them . . - and never break a dish. Update: 30-May-2016: Fans of Ray Bradbury's chilling 1950's tale There Will Come Soft Rains recall this robotic solution to the dishwashing problem. End update. I'm ready for practical robots, and I don't care if they're humanoid or not. Via PC World from Dvice.